LiquidVPN Review 2019 | Should you buy this VPN Service? 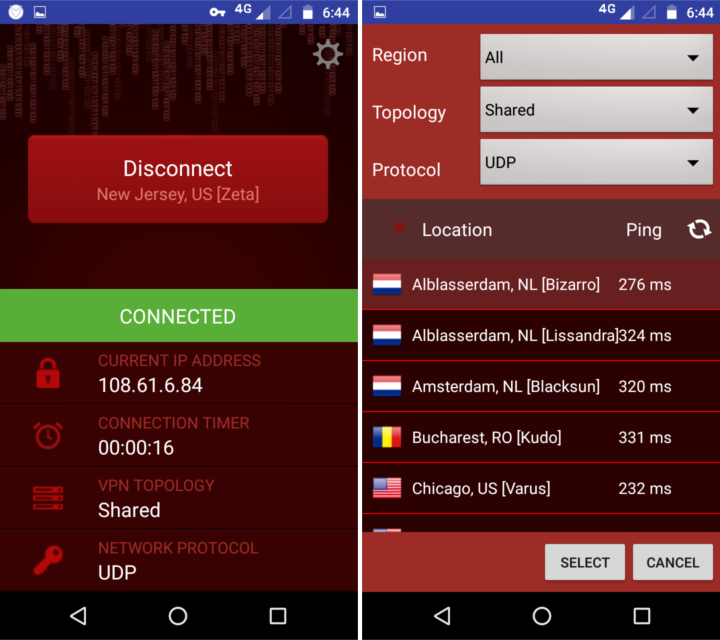 US-based LiquidVPN offers robust security features, fast speeds, and easy-to-use apps at a good price, but few server locations. Dave Cox launched LiquidVPN in 2013 after 15 years spent working in data centers and with software vendors in the United States. Making the internet better for himself and the rest of the world became “his personal crusade,” and he sought to offer a more robust VPN solution than the competition. Today, LiquidVPN is a solid option for privacy-conscious users who want few extra security functions to help stay anonymous. The company is a smaller outfit, so it lacks the huge network of some of the major players, but it stacks up surprisingly well when it comes to performance, design, and features. LiquidVPN offers three different plans: Sidekick, Road Warrior, and Ultimate. The only difference between the plans other than the price is the number of devices that can be connected at the same time. Sidekick costs $7 per month or $4.75 per month with a year-long plan and nets you two simultaneously connected devices. Road Warrior allows for four simultaneous devices for $10 per month or $5.75 per month with a one-year plan. Ultimate’s eight simultaneous devices is ideal for a household or small office, costing $18 per month or $8.83 per month with a one-year plan. Update, October 14, 2016: If you sign up via this page and use the code “COMP20” at checkout, a 20% discount is applied to whichever plan you choose. The prices aren’t the cheapest we’ve ever seen but are definitely below average, making LiquidVPN a reasonable purchase for budget-minded subscribers. The company accepts credit cards, PayPal, cash, and a long list of cryptocurrencies including Bitcoin, Litecoin, Peercoin, Darkcoin, Dogecoin, Vertcoin, Xcurrency and BitcoinDark. All subscriptions come with a seven-day money-back guarantee, but there’s no free trial option. LiquidVPN makes apps for Windows, Mac, Android, and iOS. Linux and other operating systems will need to use a third-party VPN app to connect. A couple features of LiquidVPN make it stand out among the crowded market of competitors. The first is the choice of three different types of IP addresses to choose from. Shared IPs are the norm for most VPN providers. They tend to offer the fastest download times, making them ideal for streaming and torrenting. You are assigned an IP address that’s also used by dozens, possibly hundreds of other people, adding a significant layer of anonymity. Next is private static IPs. You get your own IP address and it never changes. Also called a dedicated IP, it is best for apps and websites that are IP-sensitive, such as online banking and gaming. When a website makes you verify your identity because it doesn’t recognize your device, it’s because your IP address changed since the last time you used it. 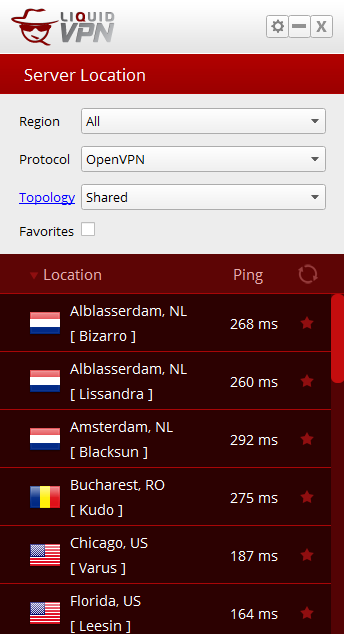 Finally, the modulating IP option is LiquidVPN’s coup de gras. Each time you connect to a web server, your IP address changes to another shared IP address. The web page completes the connection with multiple IP addresses and cannot pinpoint a single IP address for the user. This is the most difficult IP to track and is suited for those seeking the highest level of anonymity. LiquidVPN is the only provider we know of that offers modulating IPs. Next up is Liquid Lock. Available for the Windows and Mac desktop clients, Liquid Lock functions as a firewall and an internet kill switch. With Liquid Lock enabled, if your connection to the VPN server drops, all internet traffic will be halted. This prevents your real IP address and location from being seen by a website while also stopping your ISP from snooping on unencrypted traffic. Liquid Lock also prevents DNS and WebRTC leaks. Liquid Lock’s firewall feature cuts off a device from the internet entirely except for traffic going to LiquidVPN’s servers. Users can whitelist specific IP addresses and allow LAN traffic through in the settings. LiquidVPN operates its own DNS servers that users automatically use when connected, but custom DNS server addresses can also be specified in the settings. OpenVPN is the default connection protocol and the one we recommend. OpenVPN over TCP and UDP are both available, as are L2TP/IPSec, SSTP, and PPTP. Users can select from 10 different VPN ports, which is handy for applications that require port forwarding. Bandwidth, server switches, and port switches are all unlimited. LiquidVPN does not limit P2P filesharing or BitTorrent traffic. We were able to stream American Netflix from outside the United States during our testing. We watched a show specific to the US catalog and did not receive the Netflix proxy error. LiquidVPN works with US Netflix as of time of writing. Setting up LiquidVPN is a straightforward download, install, log in process on both desktop and mobile. Note that the password you use to log into the website could be different than the one you log into the VPN app with. If you’re a frequent VPN user, saw the LiquidVPN app, and thought, “That looks awfully familiar,” there’s a good reason for that. It’s almost the exact same layout at the VyprVPN app with a few minor alterations and a different skin. Clearly, one drew inspiration from the other or they both have a designer in common. Similarities aside, the apps are very easy to use despite the wealth of options one can choose from. The main page displays your IP address, connection time, topology, and VPN protocol. Topology is the word used to describe the different types of IP addresses: shared, private static, and modulating. Clicking the location pin to the right of the connect button will bring up a list of servers that can be sorted by latency (ping time) and location. At the top, you can filter servers by region, protocol, and topology. Servers can be favorited for quicker searching later. The cog button at the top opens the remaining settings, support, and feedback. You can submit a help ticket directly from the app. The settings include startup options, port, OpenVPN protocol, DNS control, and the Liquid Lock whitelist. The app can be minimized to the system tray when not in use. Right clicking the icon gives three simple options: Connect, Show (open the app), and Quit. Our only complaint is the lack of a “back” button to go back to the main screen from the server select. The mobile app is very similar to the desktop version minus the Liquid Lock, which isn’t available yet for iOS and Android. LiquidVPN operates about 40 servers across nine countries. The country selection is pretty limited. With the exception of Singapore, all the servers are located in North America and Europe. There are none in South America, Africa, Australia, or the rest of Asia. You can see all servers and locations here. In addition to protocol and topology, users can choose a server based on how they want to use it. Some servers are P2P optimized for fast torrenting, while others are DDoS-protected for reliable connections. You’ll have to visit the LiquidVPN website to find out which are which, however, as these optimizations currently aren’t listed in the app. LiquidVPN leases server space at Tier 3 data centers to operate its network. Tier 3 guarantees the second-best uptime, with Tier 4 being the highest. This essentially means LiquidVPN doesn’t own its own servers or data centers, which isn’t unusual for a VPN provider but can be a concern for the most privacy-conscious among us. On the other hand, it does guarantee a very reliable service. Performance was solid overall with a couple exceptions. We easily streamed 1080p HD video, which loaded far ahead of the buffer. We were also able to play Brawlhalla, a Super Smash Bros- style online fighting game, without any noticeable lag on North American servers from our tester’s location in Argentina. To test download speeds more empirically, we downloaded the same 82.7MB file (compressed from 103MB) three times from three different servers at three different times per day for a total of nine tests. For comparison’s sake, we tested LiquidVPN alongside ExpressVPN and ran the downloads without a VPN as a control group. Our tester connected to a West Coast US server, East Coast US server, and a UK server. In the boxplot below, the thick black line represents the median download time, while the red diamond represents the mean. Lower is better. LiquidVPN beat ExpressVPN for both mean and median download times, though just barely on the former. ExpressVPN’s performance was more consistent, while LiquidVPN has one or two tests that made it a bit more volatile. ExpressVPN is one of the fastest VPN’s we’ve tested, so this is an impressive result from the junior provider. All OpenVPN connections through the LiquidVPN app are 256-bit AES encrypted, which is on par with the strongest encryption levels offered by other providers. LiquidVPN is also one of the few providers to utilize perfect forward secrecy. Forward secrecy protects past sessions against future compromises of secret keys and passwords. A new private key is generated for every session instead of a single “master key” that could be used to decrypt all current and past traffic. LiquidVPN keeps zero activity logs and minimal metadata logs. The metadata collected includes your last VPN logged into, the total number of logins and bandwidth used. Timestamps and IP addresses are not stored. The company is based in the US, which means it is subject to warrants and subpoenas from law enforcement and spying agencies. For this reason, LiquidVPN keeps a warrant canary on its site, which is updated weekly. If the warrant canary disappears, then that means a warrant has been served to LiquidVPN for law enforcement to gather information on users. Customer support consists of a simple ticket submission system. You can submit a ticket either by email or directly from the app. There is no live chat or phone support. We received a satisfactory response from customer support within 30 minutes of submitting a ticket. LiquidVPN’s website and app contain no advertisements for anything other than the product it’s selling. We didn’t receive any unsolicited emails during our test period. LiquidVPN boasts an impressive package for an up-and-coming provider. It sports top-notch security features, including a modulating IP address option that we’ve not seen elsewhere. Download speeds are great. The apps are intuitive and easy to use. The customer service isn’t live, but they were fast to respond to our tickets. The price is very reasonable for what you get. Update, October 14, 2016: if you sign up here and use the code “COMP20” there’s 20% off all plans. The selection of server location is pretty limited, especially outside of the US, Canada, and Europe. 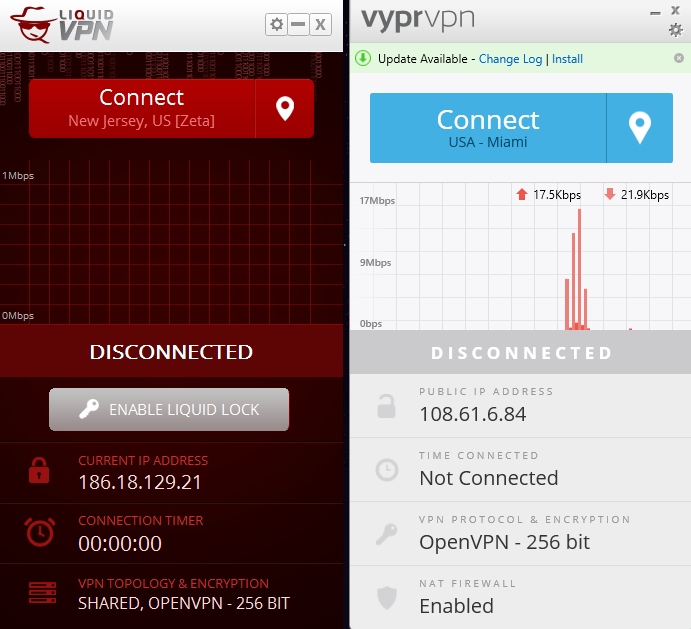 LiquidVPN is based in the US, which might put off some users distrusting of the NSA and other American spy agencies. I’ve used approximately 10 different VPN providers over the years. Recently I tested 6 for my next subscription and settled on LiquidVPN. On average the service was the fastest I tested. It has absolutely no DNS leaks and it has worked flawlessly. The only issue I’ve had is a couple start/stop errors on the Android app if another VPN was trying to connect. None of the errors caused the service to fail or expose my IP. 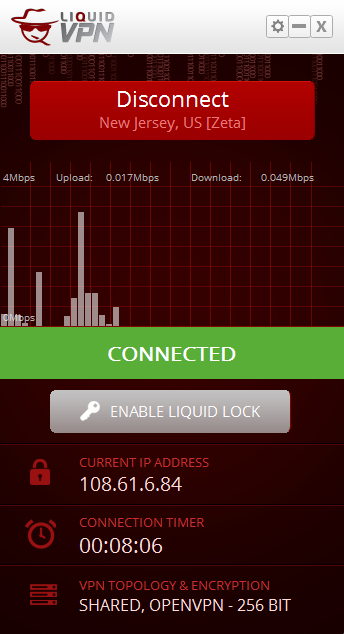 I’ve used LiquidVPN on PCs, routers and phones for several months now. LiquidVPN customer service has also been very good. While they don’t have a live chat option, they are quick to answer email and they were able to help with a router setup question that I had. They also said they will work to incorporate some of my suggestions into the next versions of their apps. I could not be more pleased with Liquidvpn and I highly recommend them. I have never seen anything like this modulating IP toplogy. I don’t even understand how they can do this and not break every website. I use bearshare and bittorrent. You might want to make a note that this is one of the few VPN services that can deliver great speeds on bearshare.